DoglopedixThe sport of dog surfing has developed its own special series of competitions that grow both in number and in participation in recent years. There are now contests in San Francisco, San Diego, Los Angeles, Hawaii, and other places around the world. 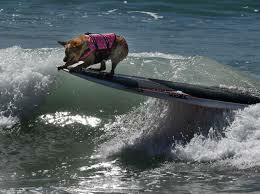 The most common are San Diego windsurfing dog competitions.